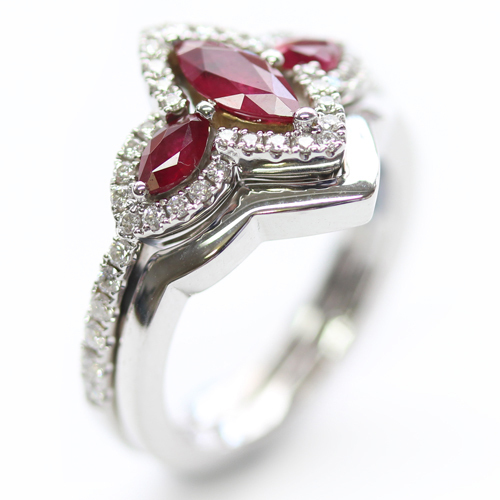 18ct White Gold Plain Fitted Wedding Ring to Ruby Trilogy Engagement Ring — Form Bespoke Jewellers Ltd.
A plain fitted wedding ring handmade to sit perfectly next to a ruby trilogy engagement ring. Fitted wedding rings are a specialism of ours. 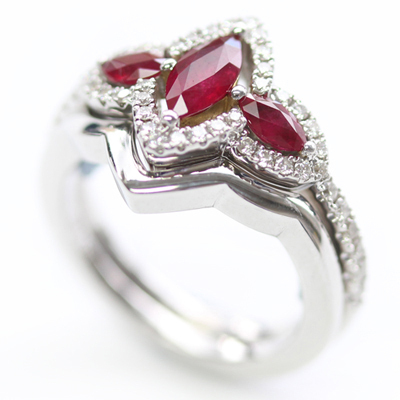 As a bespoke jewellers, we have the ability to create almost any design. So, when it comes to matching a unique or unusual profile of an engagement ring, a handmade fitted wedding ring is often the best choice. 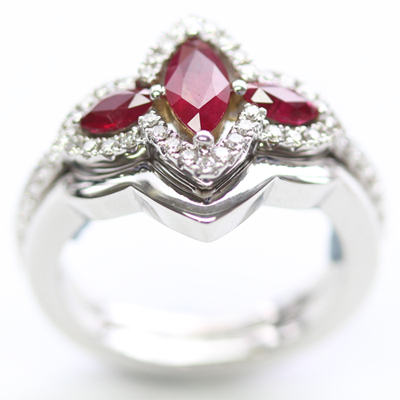 In this instance, the customer had a trilogy ruby engagement ring with a halo-style design. Tim, one of our expert jewellers, created a pewter model of a fitted wedding ring that would sit perfectly alongside the undulating edge of their engagement ring. The pewter model was then sent to the casters and cast in matching 18ct white gold. The ring was then hand finished and polished in our Yorkshire studio and the customer was thrilled with their bespoke, handmade fitted wedding ring. A perfect fit!